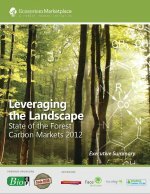 The report, which aggregates data from 415 individual forest carbon projects historically, was published Thursday by Forest Trends’ Ecosystem Marketplace, a world-leading provider of news, data and analytics on environmental markets and investments in conservation. The report examines a variety of strategies for injecting financial resources into projects that save or plant forests that capture carbon. Carbon offsets from these projects averaged $9.2 per tonne of sequestered carbon in 2011, up from $4.6 per tonne in 2010.